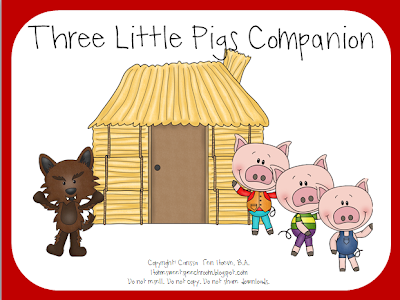 The First Birthday Giveaway Week wraps up with Three Little Pigs book companion giveaway from Home Sweet Speech Room. This enormous 60 page companion pack contains activities for speech, language, and literacy. Materials include: sequencing cards, comparing and contrasting activities, question formulation, character vocabulary cards, comprehension questions, true/false cards, articulation cards, and much much more. Its perfect for working on some many different speech, language, and literacy goals and the materials will easily last you for 3-5 sessions!! This would be a great tool for my graduate students in the clinic. They always need additional materials to expand stories. One of my favorite stories. Cant wait to use these activities with my kiddos. I wish i can win this one!!! Everything from Home Sweet Speech Room is well done and comprehensive. I love storybook companions and would LOVE to add this one to my tool kit. I would use it with my preschoolers and kindergarten era! I would use this with my whole caseload. I especially would love to have this to use with my PreK/PPCD and PreK kids. Book companions are my absolute favorite to use but sadly I do not have many… Thanks for sharing and the giveaway opportunity!